I know we're in the middle of swatching our Barry M Dazzle Dusts, but I just had to take out a bit of time to show off my haul - we'll be back to the Dazzle Dusts in my next post, promise! 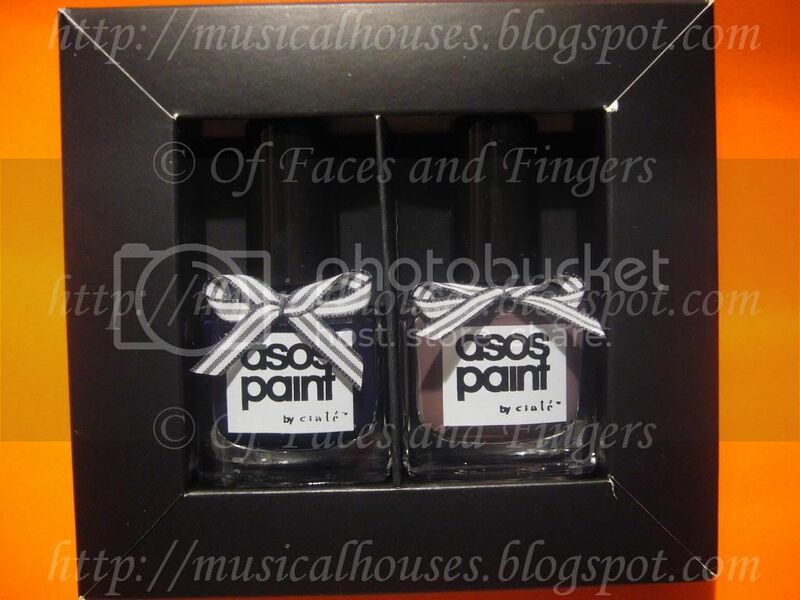 ASOS had a sale and I bought makeup and nail polish, and only makeup and nail polish. I don't know why I have that problem. I never buy clothes, rarely buy shoes, occasionally buy bags (my other weakness), but give me a sale and throw in some makeup and I'll be all over it. 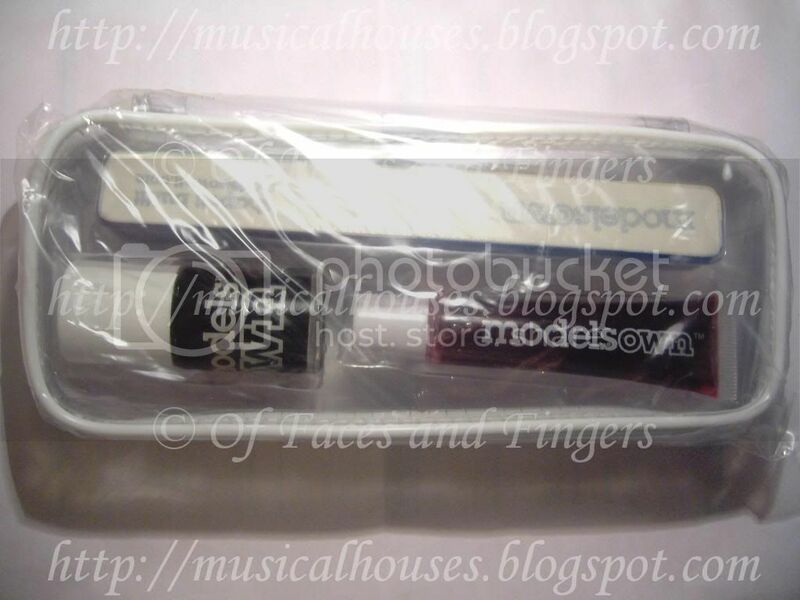 Anyway, this means I get to show off my haul, and because I love you guys (aww! ), I included a couple of bottle comparison pictures. I know they're bottle comparison pictures and not swatches, but I promise I'll get around to the swatching soon! I know, it's a beautiful thing right?! Ok, Ok, so on to the comparison pics. I do intend to swatch and review these and make them more extensive, but here is why I didn't buy Chanel Particuliere, although purply-brown-grey nail colours are just my thing. 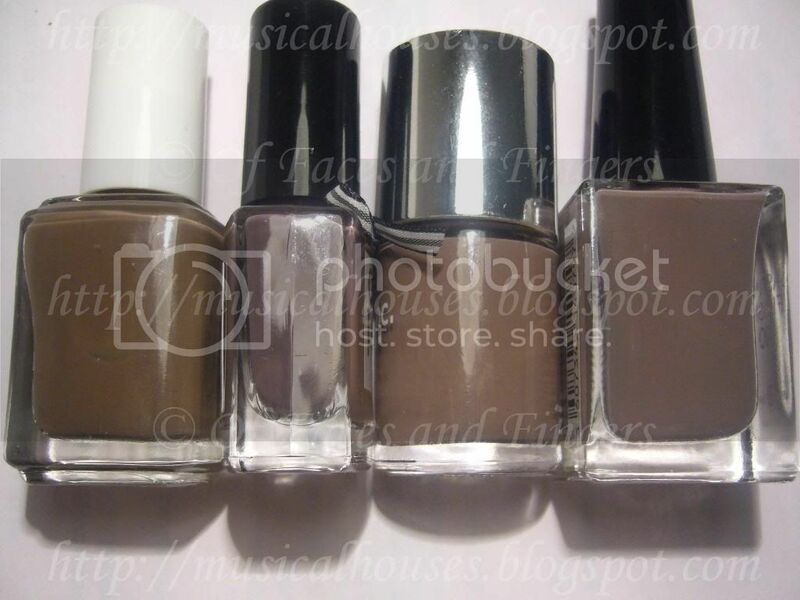 *clears throat* I already have too many taupey-purply-brown-grey nail colours. I know Particuliere may not be a dupe for any of them, but I feel like I may have too many shades in the same colour family, as it is. I know, that's not a lot by nail fanatic standards, but by civilian standards, that's way too many! :X And what's more, these are just the ones I have here. There are a couple that I don't have on me right now, like $OPI Metro Chic. See, I tell you, I can own all of them because they're NOT identical, not even in the bottle, even if they're all close. Honestly, this makes me vacilliate a lot on Chanel Particuliere, because chances are, I know Particuliere won't be an exact dupe for any of these, but it'll probably be pretty close. And while I abide by the if-it-isn't-an-exact-dupe-it's-a-justified-buy rule of nail fanatics, I also know that 99.99% of people aren't going to be able to tell the difference. Add that to the fact that Chanels here retail for 16GBP (and yes, I do know they're more expensive elsewhere), and you get a very indecisive girl. That said, I am happy with what I have, and here's how they're different. 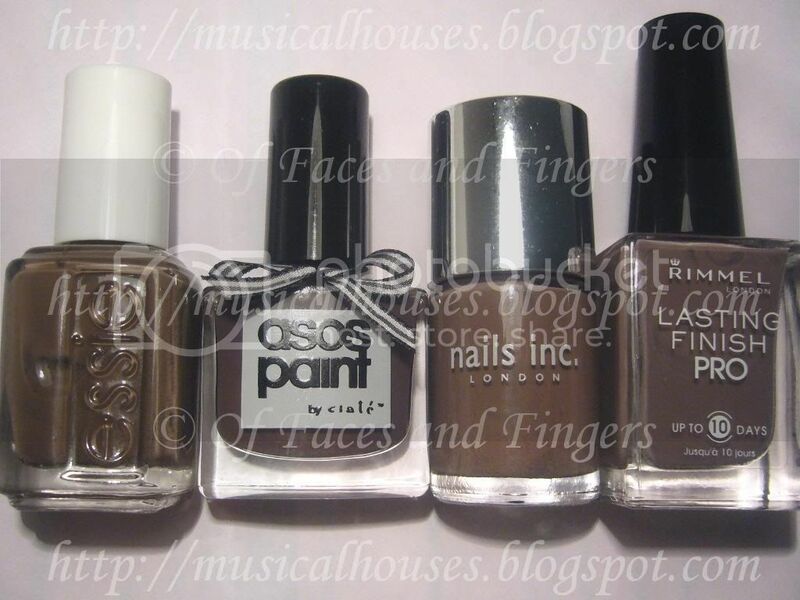 ASOS by Ciate Sienna is the most purple, while Essie Mink Muffs is the most brown, and Rimmel Steel Grey has strong hints of purple and grey, while Nails Inc Jermyn Street is an equal mix of all three. If you're just going for one, I guess which colour you'd be picking is a matter of preference, and skin undertone. I think they're all neutral enough to be worn by most people, but if you really want to split hairs, in general, some purples and greys can look a little odd on girls who are really warmtoned, so if you're really warm, you might want to try Essie Mink Muffs and Nails Inc Jermyn Street, which are more brown. If you're cooltoned and you love your purples, Asos by Ciate Sienna is a good pick, while if you want something a tad more grey, Rimmel Steel Grey (which is only partly grey) is perhaps best. Alright, showing-off time over! We'll be back to the Barry M Dazzle Dusts in my next post. Thanks for humouring me guys! 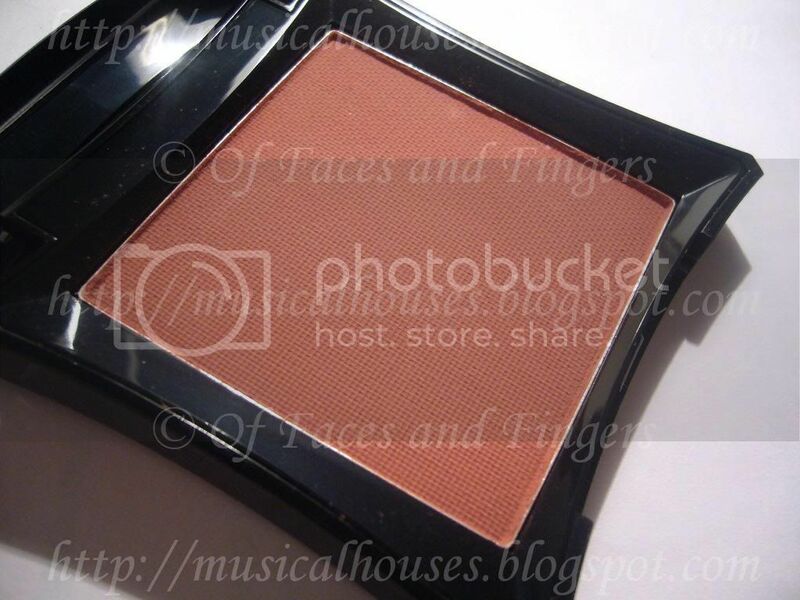 ooooo PLEASE swatch that blush! I want to know how the Illamasqua blushes compare to the NARS ones! And ... not that I'm trying to change your mind or anything, but if I recall correctly the Chanel is not particularly purple and quite a bit lighter than any of the polishes you have there (and $OPI Metro Chic). Wow your blog is awesome! @Catherine: I've heard Essie's Mink Muffs and OPI's YDKJ are the closest dupes for Particuliere, because Particuliere is more brown than purple. But I'm not quite a fan of brown-brown (I personally prefer more purple), so I might just pass over Particuliere anyway...Can't say I'm not tempted though! Great haul! That Illamasqua blush is very pretty! Cool blog btw. really helpful, i stumble upon it a few times that i think i'm gonna start to follow the blog.